i have heard it said that character is who you are when no one is looking. despite all those years in high school and college i spent pretending that i wasn't scared of rejection, behind closed doors, in the still of the night i was nothing more than a scared little girl. i wasted years caring more about what people thought about me instead of caring for people. i neglected time seeking selfish desires and making futile attempts of acting like i had it all together. when no one was looking, i was just a girl who wanted to feel loved. to feel pursued. to be accepted. ironically enough, the moment i met the man who would love me in spite of my worst days, i also fell head over heels in love with One who pursued me all along. all those moments felt wasted. and all the ones that came after have been part of a grand design. a molding process of shaping me into who i am today. i no longer waste precious time wishing things could have been differently. i have embraced my story for what it is. a beautiful story of redemption and grace. a story unique for me. a story designed to gently lead me into His purpose for my life. 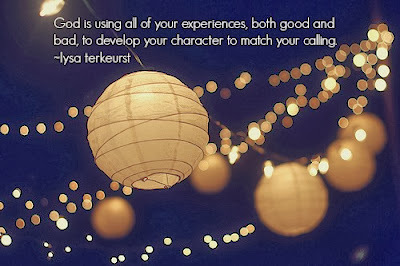 how have your experiences guided you into your calling?